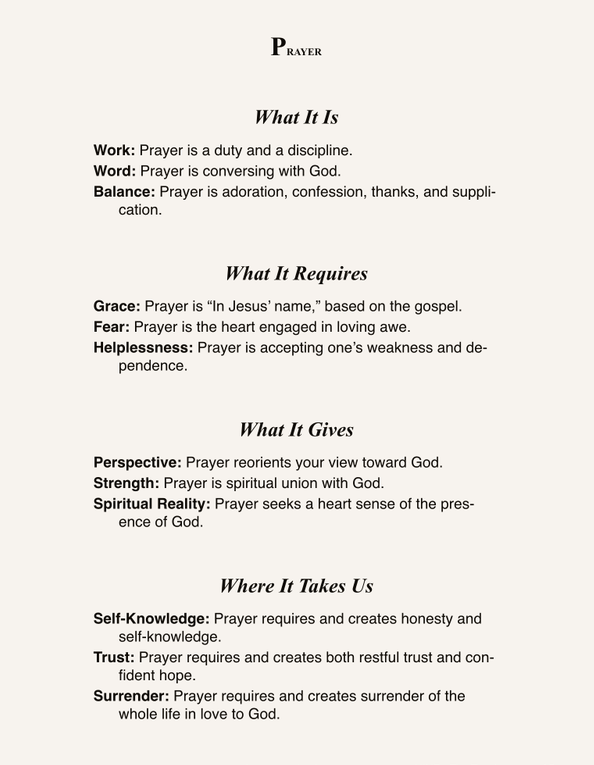 The following chart is from Tim Keller's book "Prayer"-I thought I'd share it as a helpful guide in defining specific aspects of what prayer is as well as a preview for the book (as it is a summary of what he teaches in the book itself). Enjoy! I’d love to know if anyone has thoughts, pushback, questions, or just really liked it. Anything stand out, for good or for not so good reasons? Feel free to sound off in the comments below. I think the first line always get me when this topic comes up. Prayer is a duty and a discipline. Prayer takes work. It really does. Especially when it involves intercession. If I only pray when i feel like it or feel up to it, I am afraid that I will often miss out only balanced prayer (only making supplication or only giving thanks–that’s usually the two I gravitate towards) and I am afraid i will miss out on most everything else listed here. One way I want to grow in this is to take a few minutes to pray when I get home from work. I find that I get a lot of perspective in the morning before I go in but when I get home I become the most self-centered and less likely to consider the Lord and how he may be leading me in the evening. I need to recognize my quiet time is not the summation of my walk with God. I desire to commune with him throughout the day, recognizing my utter dependence morning, noon, and night. YES! This has been a huge paradigm shift for me recently as well. Having a daily quiet time doesn’t check all of my spiritual “to-do”s in one fell swoop. Neither does it (by itself, without any other thoughts of or communion with him) maintain my relationship with Jesus for the day. Rather, it’s simply one aspect of many that are required if I’m to pursue intimacy with the Lord in a disciplined and holistic manner. Prayer takes work but it’s completely worth it! Thanks for sharing your thoughts here and on the other post!